A horse riding holiday is an excellent opportunity for you to get away from it all and enjoy nature. Whether you are looking to go as a single or a family, as a novice or an experienced rider, there are horse riding holidays that will fit all your needs. There are many different holidays available all around the UK. Before you begin looking, you should ask yourself a few questions. What type of scenery do you want explore on your holiday? Do you love riding along the quiet, beautiful beach or do you love to ride through mountains? Maybe you rather enjoy going by lush lakes or through the calming countryside. You will also have to think about what type of accommodation you would like to have while you stay on your holiday. Some prefer to rest in a luxurious hotel after a ride, some prefer to camp out, while even others prefer to take their holiday on a working farm. Next, you will have to decide if you will be taking your own horse or using the horses that are provided by the riding centres. When you are not in a relationship, you may be reluctant to go on a holiday. But, there are horse riding centres that have holidays specifically designed for people who are single, whether it be because of divorce or death. 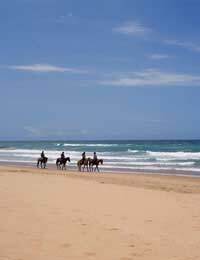 Just because you are without a significant other does not mean you cannot enjoy a sociable horse riding holiday. These holidays are great for independent travellers who want to enjoy good riding and excellent cuisine while being in the mist of friendly people. Centres that specialize is serving singles will often go out of their way to make you feel more comfortable. Some centres even offer online bulletin boards so you can post and read messages before you go on your holiday. This allows you to meet your fellow guests that will be travelling with you before you even arrive. When you are travelling to a horse riding holiday as a couple, you need to think about what takes priority in your trip. Are you looking for a romantic getaway that just happens to include horseback riding or are you looking to go to a centre that will help you and your partner relax but also further develop your riding skills?. Some centres will focus more on romance - romantic candlelit dinners, private villas next to a beach, etc. Some centres will recognize you as a couple, so you may get certain romantic perks, but the gist of the holiday will be to advance your riding skills. Family horseback riding holidays can be a great experience, but you need to ask yourself if the whole family wants to spend their entire vacation riding horses. If you have children that would rather ride the horses a bit, then partake in other centre activities; look for a centre that offers other things to do, such as a laser blast area, laser clays, bungee trampolines, or climbing walls. Whether you are looking to explore the rugged coastline, ride through the striking countryside, or trot along the beach at sunset, there is a horse riding holiday just waiting for you!